Plans for Burnham Place represents the most economically catalytic project for the National Capitol Region for decades to come, and will provide a new commercial center atop an expanded multi-modal station with monumental architecture and triple its existing passenger capacity Burnham Place will be ideally located at the convergence of the city's Central Business District, Capitol Hill, NoMa, and H Street, NE neighborhoods with unparalleled accessibility. 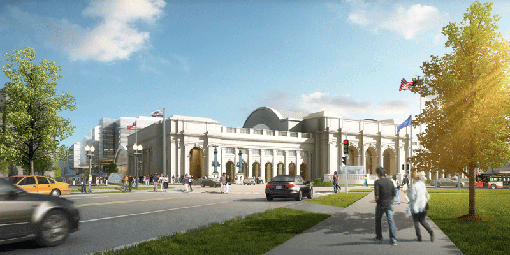 The Union Station Redevelopment Corporation (USRC) in coordination with Amtrak, is proposing to expand and modernize Washington Union Station to support current and future growth in rail service and operational needs. The station project’s goals include facilitating safe and efficient travel, and providing a positive station visitor experience. The Federal Railroad Administration (FRA) is preparing an Environmental Impact Statement (EIS) for the station project. Please visit the station project website to learn more: www.WUSStationexpansion.com..